Over the last few months, a particular pastry has had the internet abuzz with images of lines going around the block, more than 2 hour long wait time and black market sales. What confectionery delight can cause this? Well, it is the all powerful Cronut. Hailing all the way from the Dominique Ansel Bakery in New York city, this half croissant, half doughnut, a frankenpastry if you will, has got people talking and dreaming of this elusive pastry. So, when we heard that Montreal’s own La Cornetteria, over in little Italy, had come up with their own part croissant, part donught creation, we had to find out more. Since we can’t easily go down to New York anytime we want to and wait in the early morning 2 hour lineup, the fact that La Cornetteria now has their own version makes a trip to 6528 St Laurent a much more reasonable option. We were fortunate enough to speak to La Cornetteria’s Alessandro Ficca to get some answers regarding this new addition to Montreal’s baked goods scene. Started in 2006, La Cornetteria was initially a wholesale bakery selling to restaurants and cafes. It was always situated at its 6528 St Laurent address and would later open its doors to the public in 2008. La Cornetteria has made a name for itself with its wildly popular cornetto, which looks like a croissant but has a different flavour and brioche-like texture. The cornetto comes with fillings of ricotta, nutella, and jam. When it came to tackling the famed New York city Cronut, the Cornetteria team (Alessandro, Giovanni and Stefano) was up for the challenge. 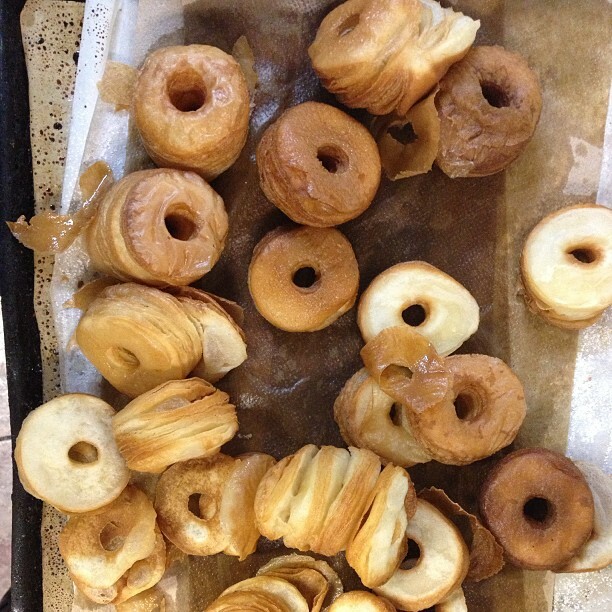 Initially, they tried taking their Cornetto down and frying it into a cronut. That did not work as intended but they knew that sticking with their Cornetto base would be their recipe for success and have that distinctive Cornetteria mark. The main challenges were the folding of the dough. They worked at it over and over until they got it to where they wanted it to be. The next was the batch size. Doing a few from scratch is different than making hundreds and thousands. Finding a way to streamline the process will help avoid those now famous 2 hour lineups in New York city. The whole process began back in May and now you, too, can have your very own Cronetto. All you need to do is head down to Little Italy and go see the good people at La Cornetteria to try out this part croissant, part doughnut creation. Initial flavours will be classic custard but do expect new flavours and combinations to pop up over time. So, if you are curious to have a taste of what everyone is talking about then make your way to La Cornetteria in Little Italy situated on 6528 St.Laurent. They are open Monday to Saturday from 7am to 6pm and on Sundays from 8:30am to 6pm. Also try out their Cornetto (Italian sweet croissant) as well as their other desserts, cakes and cookies. 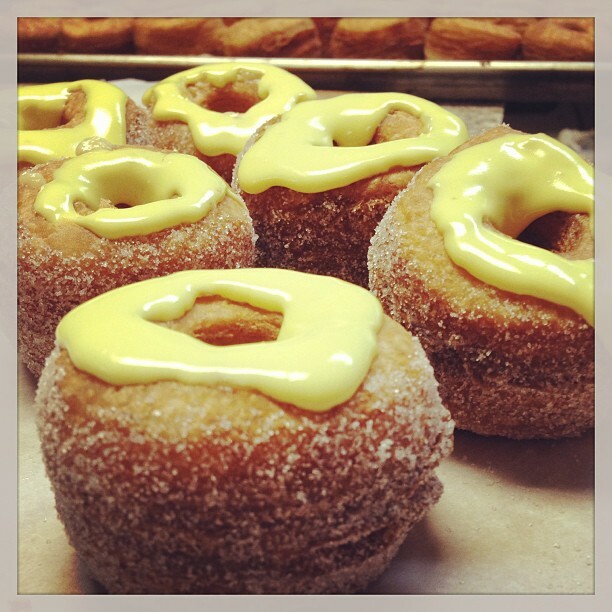 the cronuts always sell out. 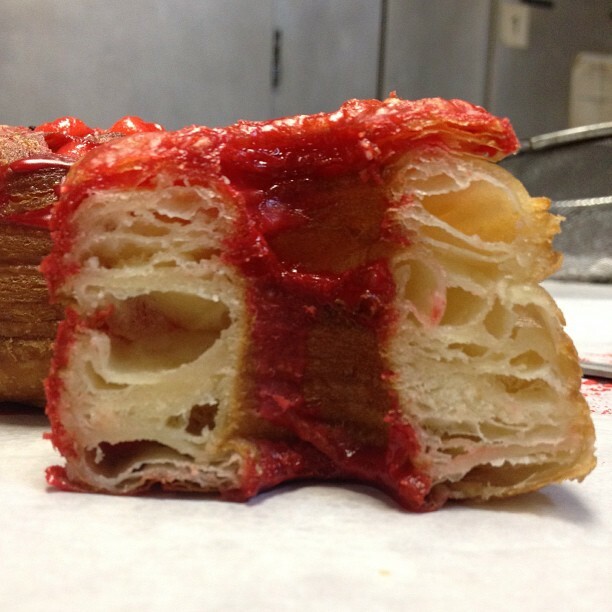 The cronut is now also available at La Conca D’Doro.